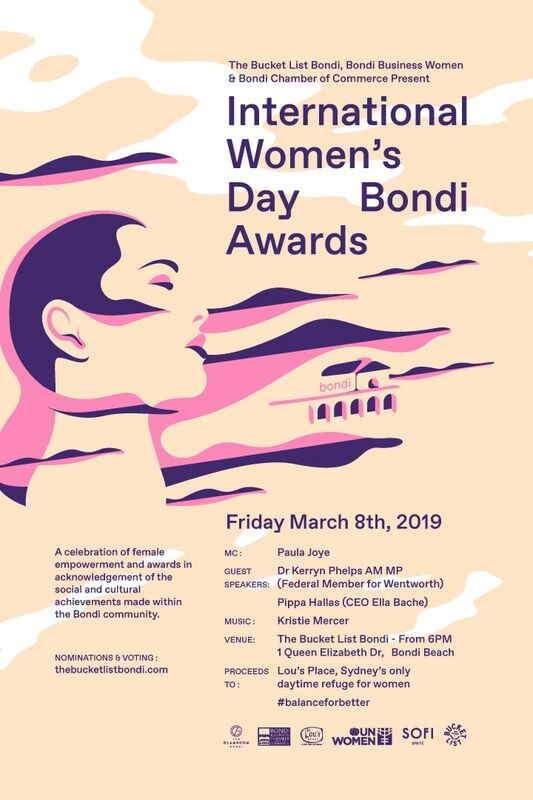 INTERNATIONAL WOMEN'S DAY AWARDS, BONDI 2019. Supporting Lou's Place Womens Crisis & Refuge Centre. We're very excited to announce the 2nd annual International Women’s Day Awards, Bondi. An evening to celebrate women’s empowerment and to acknowledge the social and cultural achievements of women within our community. Final voting is now open! Please place your vote at the link above, voting takes only a few moments. Speak up for the amazing women in your community & make your vote count. Raffle prizes and donations on the door supporting Lou’s Place, Sydney's only daytime women’s refuge crisis centre which receives no government funding and relies solely on public donations. & a bespoke menu from Chef Tom Walton.